WholeMune primes immune cells without stimulating the immune system, making it the preferred product for season-long immune readiness. A strong immune system is integral to overall health and wellbeing. Maintaining a strong immune system can often be a challenge in today’s world-high stress levels, poor diet, lack of sleep and environmental pollutants can slow down immune response. 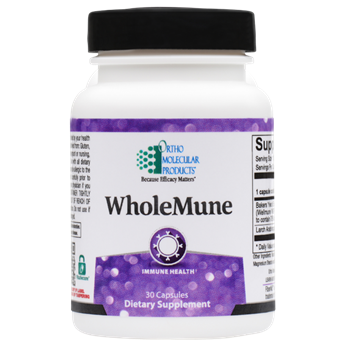 WholeMune is formulated with Wellmune WGP®, the most well-researched, single beta glucan, proven in human clinical trials to prepare and protect the immune system from repeated and ongoing stressors. Wellmune WGP® is a highly purified, yeast-free beta glucan extract derived from Saccharomyces cerevisiae. It is standardized to contain 75% pure beta glucan and is considered the most effective single nutrient to naturally prime immune cells.